The pain and discomfort of a sore throat can range from mild to severe burning to swollen, red tonsils to itchiness and a dry, scratchy sensation. This sometimes temporary ailment may be caused by infectious agents, exposure to extremely dry environments, or the presence of a foreign object. Sore Throat: Is It Contagious? How Long Is a Sore Throat Contagious? There are different types of sore throat, based on the underlying cause and its location within the throat region. Pharyngitis is the most common form of sore throat, chiefly caused by a viral strain. This type often accompanies the influenza virus (flu) or the common cold. The pathogens target the pharynx, located behind the soft palate of the mouth. It is often simply called the throat. This area is where the food and drink you ingest pass before entering the esophagus and stomach. Another type of sore throat is laryngitis, or an inflamed voice box. The larynx sits below the pharynx at the top of the trachea, where it prevents food from entering the windpipe. This organ forces air to both enter and exit the lungs. Inflammation of the larynx causes a painful sore throat, coughing, and breathing difficulty. Inflammation of the tonsils may also cause a sore throat as these lymphatic tissues are found on either side of the tongue’s base. Tonsillitis is caused by bacterial or viral infections, including the bacterial streptococcal infection that is known as strep throat. A rare but painful type of sore throat is an inflamed epiglottis, referred to as epiglottitis. The epiglottis is located at the top of the larynx under the base of the tongue. The human immunodeficiency virus, or HIV, attacks the immune system and may progress into the condition known as acquired immunodeficiency syndrome (AIDS). In the early stages of HIV, many of the symptoms mimic the flu or common cold, including a sore throat. A large percentage of patients diagnosed with primary HIV infection reported, and presented with, infections such as pharyngitis and strep throat in an analysis of national ambulatory databases published in the September 2005 issue of the Annals of Family Medicine. Oropharyngeal cancer refers to the presence of cancerous cells in the oropharynx, which comprises the tonsils, soft palate, pharynx walls, and the base of the tongue within the mid-throat region. A sore throat may be triggered by the presence of a lump, which also causes difficulty swallowing, severe coughing, ear pain, and weight loss. 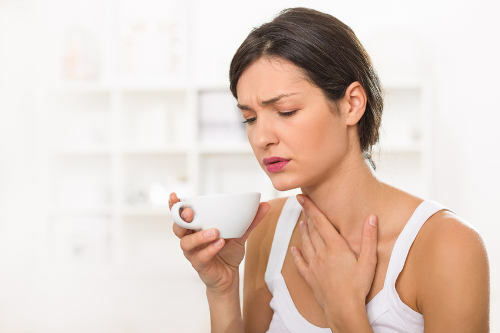 A sore throat is one of the early signs of throat cancer, along with a persistent cough, difficulty swallowing, wheezing, and inflamed lymph nodes. Throat cancer is the development of cancerous cells within the vocal cords, voice box, tonsils, or the oropharynx. This form of cancer is divided into two groups, pharyngeal and laryngeal cancers. Gastroesophageal reflux disease, commonly referred to as GERD, may result in a sore throat as the stomach acid is regurgitated into the back of the throat. Over time, this may damage the esophageal lining. This form of sore throat can cause hoarseness as the stomach acid travels to the voice box, or larynx. A viral infection is caused by harmful organisms that invade and destroy healthy cells in order to spread the infection. Viruses like the common cold and flu can cause a sore throat when invading the upper respiratory tract. Acute throat infections are responsible for two to four percent of all family physician visits, which makes them among the most common infectious diseases seen by the doctors. An estimated 85% to 95% of them are caused by viruses in adults and children under 5. The pain and discomfort of the throat region may be accompanied by coughing, a runny nose, and fever. A bacterial infection can also cause a sore throat as harmful bacterial strains invade the cells. These forms of bacteria may not be common but can trigger pain and discomfort, especially the group A streptococcus strain seen with strep throat. A sore throat is a common condition in smokers as the lining of the throat becomes irritated by the chemicals in tobacco smoke. Inflammation can occur in and throughout the mouth and the trachea, and may settle into the lungs. While a persistent sore throat may arouse suspicions of cancer, smoking, as well as an allergic reaction, an infection, acid reflux, or sleep apnea, may also cause injury to the throat’s lining. Whether it is a booming sound or a subtle, low vibration, snoring can cause a sore throat. Snoring results as the airways become blocked by weakened muscle tone in the throat, obstructed nasal passages, inflamed airway tissue, or an abnormally large soft palate in the mouth. As a sore throat often occurs after irritation to the lining of the throat, a tracheal intubation procedure can be a source of pain and discomfort. The procedure, which involves the insertion of a plastic tube into the windpipe to maintain an open airway, is frequently performed under general anesthesia for surgery. Among patients having this invasive procedure, incidences of postoperative sore throat range from 28% to 70%. A sore throat is a common consequence of raising the voice to the level of shouting. While people attending sporting matches or live music concerts may experience a sore throat only temporarily, those in professions that require a consistently raised voice, such as teachers or fitness instructors, often experience the condition for longer terms. Certain prescribed medications, such as corticosteroid inhalers for asthmatics, can irritate the throat lining and cause a temporary sore throat. This is also a common side effect of chemotherapy treatment. It should be noted that the underlying condition requiring the medication may actually be the source of the sore throat rather than the treatment itself. A sore throat may be the direct outcome of a concomitant illness, or a resulting illness that occurs at the same time as the primary illness. In relation to the throat region, examples of such illness may include pharyngitis as a result of GERD. An allergic reaction to pollen, dust, smoke, grass, or pet dander can also cause a sore throat. These allergens commonly cause irritation in the lining of the throat, resulting in pain as well as other allergy symptoms. A build-up of excess nasal mucus may also cause a sore throat as it drips into the throat. The environmental contaminant known as air pollution is a common widespread cause of a sore throat. While government agencies have done much to reduce the level of environmental pollutants, harmful levels of dust, ozone, and nitrogen oxides often remain in the air. Working daily with chemicals or other environmental hazards may cause chronic sore throat pain through the inhalation of irritants. Those most affected include factory workers, woodworkers, and even kitchen staff. Indoor air pollution is a common but less thought of cause of sore throats. Poor ventilation and faulty air-conditioning and heating units may be to blame. These conditions, as well as the mold and dampness found in older living and working spaces, can cause a sore throat to occur. Both heat and cold can have an effect on the mucus membranes and may lead to a sore throat. The nasal passageways are sensitive to hot air as well as cold temperatures. Levels of humidity, or the volume of water vapor existing in the surrounding air, may also cause a sore throat. A sore throat is often accompanied by minor to severe pain in the ear. This is mainly a result of the Eustachian tube connecting the back of the throat and the ears. Irritation of the lining of the throat may also affect the tube and continue into the ear. Injury or irritation may be caused by inflammation, infection, excess mucus, or medication side effects. Oftentimes, a sore throat lasts less than three days and needs no medical attention. Once the ears become involved, an infection may develop within the inner, middle, or outer ear regions. A mild earache may lessen on its own, but often requires antibiotics to heal the infection. A sore throat that appears alongside an earache may be caused by habits and conditions such as smoking, exposure to pollutants, the consumption of hot or cold foods and beverages, infections, allergies, tonsillitis, vocal cord damage, and the common cold or flu. The term “sore throat” covers a wide array of symptoms that will vary based on the root cause of the aliment. In addition to exposure to pollutants and existing health ailments, the following factors can lead to a higher risk of developing a sore throat. Age: Sore throat cases are commonly seen in young children. This may be due to their weaker immune systems and increased exposure to illnesses, especially with schoolchildren. Strep throat is one of the top causes of a sore throat in childhood. Exposure to smoke: Tobacco smoke can cause a lasting sore throat due to the high chemical content. Whether the exposure is direct through smoking or a result of second-hand smoke, the throat can become inflamed and irritated. Proximity: Close contact with someone who has a viral or bacterial infection can cause a sore throat. This is common in large family households, daycare centers, and small office buildings. Sinus problems: Persistent sinus infections see constant excess mucus to drain into the throat, causing pain and discomfort. Allergens: Allergies are a common health condition, and a sore throat can be a symptom of seasonal allergies. Pet dander, dust, and mold exposure can also cause an allergic reaction, resulting in a sore throat. Low immunity: A weakened immune system as a result of diabetes, stress, extreme fatigue, medication use, and a poor diet can indirectly cause a sore throat. Whether or not a sore throat is contagious will depend on the underlying cause of the pain. Sore throat caused by a bacterial or viral strain is a contagious condition. As the harmful organisms are found in saliva, mucus, and nasal discharge, the exchange of the fluids, as with kissing, can cause sore throat in another person. These same organisms also can be spread through the shared use of clothing, brushes, and towels. A sore throat due to injury, pollutants, allergies, or health conditions such as cancer is not contagious. A contagious sore throat can be spread for as long as the symptom itself lasts. In some cases, the sore throat may go away while the contagious infection is still present. The sore throat may also return, depending on the cause. A sore throat triggered by a bacterial infection can last as long as the strain exists, while a viral infection can be cleared within 24 hours if treated with prescription antibiotics. A sore throat can cause pain, discomfort, itchiness, or a raw burning sensation in the throat lining. This is a common symptom and condition that may be caused by illness, exposure to pollutants, or an injury to the neck region. Obvious ailments such as the common cold, strep throat, or GERD, often cause a sore throat. Other lesser-known causes include allergic reactions, snoring, and raising the voice to a shouting level. A sore throat often disappears on its own. More lasting cases may require medical attention as the cause may be more serious. “Sore Throat,” Mayo Clinic; https://www.mayoclinic.org/diseases-conditions/sore-throat/symptoms-causes/syc-20351635, last accessed March 29, 2018. Coco, A.,, MD, MS, et al., “Prevalence of Primary HIV Infection in Symptomatic Ambulatory Patients,” Annals of Family Medicine, Sept. 2005, 3(5):400-404; https://www.ncbi.nlm.nih.gov/pmc/articles/PMC1466910/, (https://dx.doi.org/10.1370%2Fafm.376), last accessed March 29, 2018. “What are the symptoms of HIV infection?” University of California San Francisco Medical Center; http://arvinteractions.org/hiv?page=basics-00-02, last accessed March 29, 2018. “Oropharyngeal Cancer: Symptoms,” Pub Med Health; https://www.ncbi.nlm.nih.gov/pubmedhealth/PMHT0024387/, last accessed March 29, 2018..
Worrall, G., MB, BS, MSc, FCFP, “Acute sore throat,” Canadian Family Physician, July 2011, 57(7):791-794; https://www.ncbi.nlm.nih.gov/pmc/articles/PMC3135445/, last accessed April 3, 2018. “The Basics of Snoring,” WebMD; https://www.webmd.com/sleep-disorders/snoring-basics, last accessed April 4, 2018. Renner, B., et al., “Environmental and non-infectious factors in the aetiology of pharyngitis (sore throat),” Inflammation Research, Oct. 2012; 61(10):1041-1052; https://www.ncbi.nlm.nih.gov/pmc/articles/PMC3439613/, (https://dx.doi.org/10.1007%2Fs00011-012-0540-9), last accessed April 4, 2018. “Sore Throat,” Centers for Disease Control and Prevention; https://www.cdc.gov/antibiotic-use/community/for-patients/common-illnesses/sore-throat.html, last accessed April 4, 2018. Davis, C.P., MD, PhD, “Is Sore Throat (Pharyngitis) Contagious?” Medicine Net; https://www.medicinenet.com/is_sore_throat_pharyngitis_contagious/article.htm#what_is_pharyngitis, last accessed April 4, 2018.